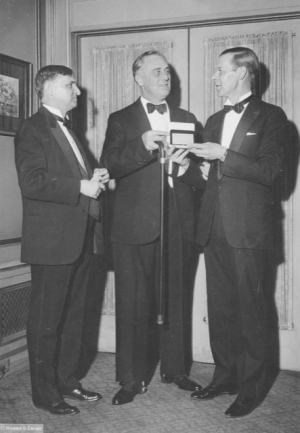 FDR receives his National Press Club membership card from President Raymond Brandt prior to the black-tie dinner in 1933. Former Club President Theodore Tiller of The Washington Times is on the left. As you can see from the accompanying photo, Roosevelt accepted the special silver-engraved membership card while standing up, something painful for him to do as he often tried to hide his disability. The braces on his legs are clearly visible at his shoes, and he seems to have a firm grip on the arm of Club President Raymond Brandt of the St. Louis Post-Dispatch. Roosevelt was still standing, supporting himself on the back of a heavy chair, when a short British Pathe news clip recorded his quips. According to The Washington Post story the next morning, as part of the membership ceremony, FDR was “assigned” by Frank B. Lloyd, who was what we now call the membership secretary, to “cover” the White House. The video of Roosevelt speaking that evening can be found here. This is another in a series provided by Club historian Gil Klein. Dig down anywhere in the Club’s 110-year history, and you will find some kind of significant event in the history of the world, the nation, Washington, journalism and the Club itself. Many of these events were caught in illustrations that tell the stories.